The August PMI (Purchasing Managers Index) registered 58.8 percent, an increase of 2.5 percentage points from July. The New Orders Index registered 60.3 percent, a 0.1-percentage-point decrease from July. The Production Index registered 61 percent, a 0.4-percentage-point increase. The Employment Index registered 59.9 percent, an increase of 4.7 percentage points. "Comments from the panel reflect expanding business conditions," says Fiore, "with new orders, production, employment, backlog and exports all growing in August, as well as supplier deliveries slowing (improving) and inventories increasing during the period. The Customers' Inventories Index experienced a sharp decline in August compared to July." Learn from LAI International's additive manufacturing experts on the critical design considerations for parts made with metal additive manufacturing systems in a production environment. As additive manufacturing continues to mature from a fad to a robust production process, complementary methods of designing for additive manufacturing need to develop. 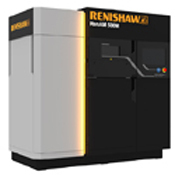 Renishaw's RenAM 500M is a laser powder bed fusion additive manufacturing system designed specifically for the production of metal components on the factory floor. It features automated powder and waste handling systems that enable consistent process quality, reduce operator touch times and ensure high standards of system safety. Learn more. Adoption of 3D printing is on the rise, as shown in surveys by companies such as Sculpteo. Of the 1000 3D printing users (metal and non-metal) surveyed by Sculpteo, 26 percent cited "accelerating product development" as their organizations' top-priority, 3D-printing-related area. Even so, manufacturers remain challenged by the cost of 3D-printing equipment and lack of in-house expertise, according to Sculpteo CEO Clement Moreau, who, in an article at ChiefExecutive.net, encourages manufacturers to seek external design and printing services. "As with any new technology there is a learning curve," he says. "As with any new technology there is a learning curve," he says. Kent Firestone, COO at Stratasys Direct Manufacturing, concurs, adding that ongoing education, investigation and experimentation are necessary for this "ever-evolving technology." 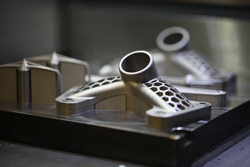 In the article, Firestone stresses that manufacturers must establish clear goals and applications for 3D metal printing, involving not just design and production, but buy-in from multiple levels of the organization. "An internal champion who can speak to both the business and technical value of the technology," says Firestone, "can be a point person for this." This is the business show for additive manufacturing and 3D printing. Learn more about the event and register. Additive Manufacturing is one of the fastest-growing technologies of the 21st century and FABTECH has taken notice. To accommodate the increasing interest in this technology, FABTECH has added a new 3D/Additive Manufacturing Pavilion. For more information about the pavilion and for exhibiting opportunities, click here. New Jersey operation has winning formula for parts production. 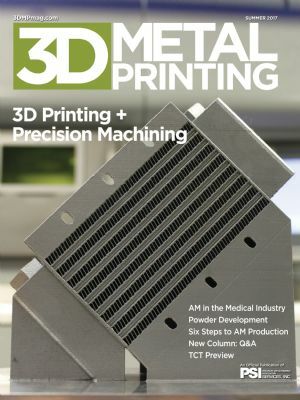 Additive manufacturing lends itself as an ideal process for medical applications. ☉ Leveraging Technologies—This Pennsylvania defense contractor and R&D company makes full use of an SLM-based powder-bed fusion machine, new cold-spray-processing equipment, and hybrid laser-cladding and finishing machine. ☉ Post-Processing Advancements—New post-processing technology from PostProcess helps Harbec, a unique company in Buffalo, NY, develop and manufacture injection-molding tooling and other products. See also: Solar Atmospheres, Arcam AB, Renishaw, Inc., Stratasys, Inc.